At Dr. Michael J. Wei’s Midtown Manhattan dental office, patients can depend on comfort and clinical expertise for a sensational smile care experience. We understand the importance of both time and smiles, so we have dedicated our careers to creating a sensational, personalized dental experience built on a standard of efficiency and dependability for each of our patients. To start, we see patients on time and we finish treatment on time, so you can schedule dentistry into your life, instead of scheduling your life around dentistry. Each of our team members is trained to provide excellent service, from the front desk, to our private consultation room, to our state-of-the-art operatories. In addition to general dentistry, like checkups and gentle cleanings, Dr. Michael J. Wei offers the latest cosmetic dentistry enhancements, such as teeth whitening, porcelain veneers, porcelain crowns, cerinate lumineers, smile makeovers, cosmetic tooth bondings, invisalign clear braces, and lifelike dental implants for discerning, sophisticated adults. You deserve dentistry that suits your lifestyle and your schedule. Located on 425 Madison Ave., near the corner of 49th Street and Madison, we serve patients who work or live near Midtown Manhattan or Central Park, as well as those from Astoria, Weehawken, and Long Island City. Call the New York dental office of Dr. Wei today to schedule your private consultation, and explore this site to learn more about how we have designed a dental experience to complement your lifestyle. When you visit our Manhattan dental office, expect to be treated with care by our friendly, welcoming team. We are here to help you every step of the way, from your first call to all follow-up and recall visits. If you have questions about any aspect of your treatment plan, clinical or financial, please ask. We’re prepared to give you answers you can understand. Our clinical team assists Dr. Wei by offering chairside assistance and hygiene care. The entire team undergoes training each year so that we can provide optimal dental care and customer service to you and your family. We are committed to your comfort, and we respect your time. If we can make your dental experience better in any way, let us know. Dr. Wei and our team invest in many hours of continuing education each year, so we bring our Manhattan patients the best that modern dentistry has to offer. From spacious treatment rooms equipped with cutting-edge technology, to services that employ restorative and esthetic foundations, at Dr. Wei’s Midtown Manhattan dental office, you’ll find all of the professional smile care you want, delivered with the care and compassion that you deserve. When you visit Dr. Michael J. Wei’s Midtown Manhattan dental office, you’ll feel like a treasured guest. We offer coffee, tea, and juice in our beverage bar, apples, and sugar- free candies. Aromatic candles create a welcoming ambiance of tranquility and relaxation. In the treatment room, you can watch a movie or listen to music with noise-canceling Bose headphones. Ask for a warm neck pillow to make yourself even more cozy during your time in the dental chair. And before you leave, be sure to freshen up with a warm, scented towel. 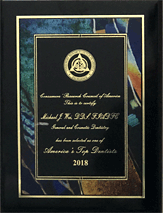 Dr. Michael J. Wei and our team have invested in the training and experience to bring our Midtown Manhattan patients many state-of-the-art dental technologies and comforts. These include intraoral cameras and chairside monitors for convenient viewing and accurate diagnoses. Intraoral cameras allow us to project an image of an individual tooth or area of concern onto a chairside viewing monitor for use as a visual aid. Digital imaging allows us to show you what your new smile could look like before you commit to treatment. We’ll take digital X-rays for a comprehensive view of your teeth and supporting structures. Digital X-rays emit about 90% less radiation than traditional radiography, and the images can be quickly and easily transmitted via the Internet to insurance companies and specialists. Furthermore, we use an electric hand piece, which produces less noise and heat than a traditional dental drill. We offer nitrous oxide, better known as laughing gas. As a sedation dentist, Dr. Wei can prescribe oral medication to make patients completely relax during treatment. We have recently introduced the STA system into our practice which will help those patients who are fearful of injections. The STA system is a computer controlled local anesthetic delivery system. It is an innovative, clinically proven way to achieve more precise and pain-free injections. This results in higher patient comfort levels. The Midwest I.D. handpiece is a high tech aid in identifying cavities in molars and pre-molars. This special handpiece is recommended for detection of cavities in pits and fissures and interproximal areas on posterior teeth that have not been restored. 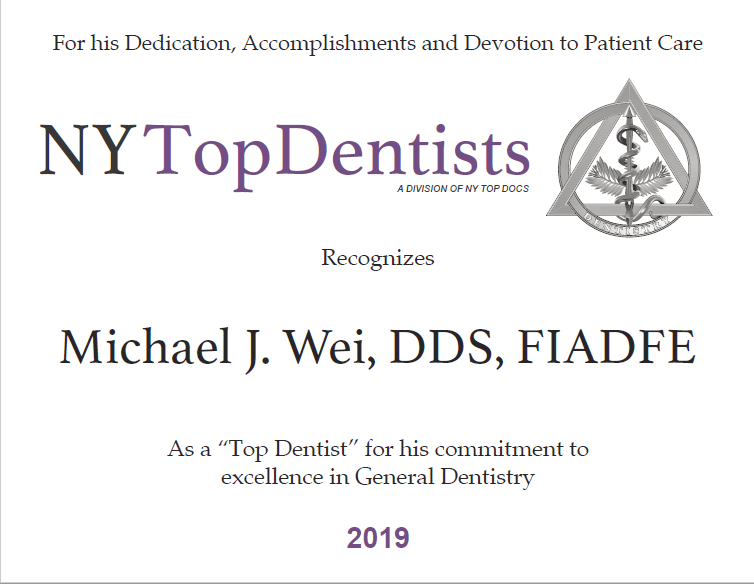 Dr. Michael J. Wei had the distinct honor of being voted one of America’s Top Dentists in 2005, 2006, 2007, 2008, 2009, 2010, 2011, 2012, 2013, 2014, 2015, 2016, 2017, and 2018 by the Consumer’s Research Council of America.